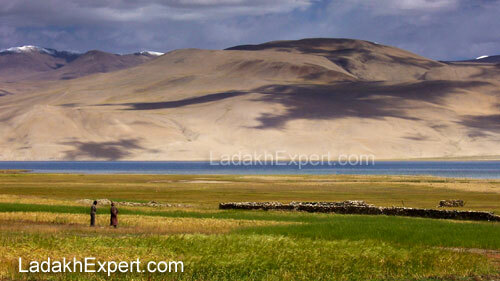 Tso Moriri is a brackish lake, located in the Changthang Plateau, 211kms from Leh. 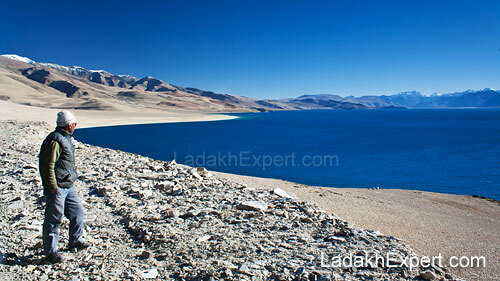 While Tso Moriri is much smaller in size in comparison to Pangong Tso, this 19km long lake is beautiful nonetheless and not only plays host to a wide variety of migratory birds during summer, but is also a declared wildlife protected area, thanks to its wetlands, which have myriad of flora and fauna. Due to this, camping in and around Tso Moriri Lake is prohibited by law, apart from the camping ground around Korzok Village (which is located on the banks of Tso Moriri). Tso Moriri is accessible throughout the year, barring a few days each year when there is enough snow to block the roads (which is usually cleared once the snowfall abates), though finding accommodation in Korzok Village during Winter months is a big chore and a cold affair. Hence for those visiting in winter, it is recommended to spend the night at Chumathang instead, which is located 70km before Tso Moriri. Leh – Upshi – Chumathang – Mahe Bridge – Sumdo – Namshang La – Tso Moriri – Take the road going towards the right from the fork just before the lake to reach Korzok Village. Alternatively, visitors can head to Manali after reaching Manali – Leh Highway, though those traveling in their own vehicles need to keep in mind that that there are no fuel pumps between Leh and Tandi, hence they need to stock enough fuel for the 550km journey from Leh to Tandi via Tso Moriri and Tso Kar. Those short on time can also club visit to Hemis, Thiksey and Shey Monasteries, while going to or coming back from Tso Moriri in order to save time, due to the fact that these Monasteries are almost along the route they will be taking. Accommodation is available at Korzok Village, which has a resort, home stays, camps and camping ground during tourist season (Mid-May to Mid-October). Korzok also has a satellite STD booth, while the last mobile phone signal is at Korzok Village. Dedicated and shared taxis for the round trip to Tso Moriri are available from Leh. While the bus service is limited to say the least, with the only bus from Leh running on the 10th, 20th and 30th of each Month! In order to visit Tso Moriri Lake, visitors need Inner Line or Protect Area Permit, which is issued by the DC Office in Leh.